Jack Baldwin in action for Posh at Blackpool. Photo: Joe Dent/theposh.com. Skipper Jack Baldwin admits the clock is ticking on Peterborough United’s League One promotion hopes, but he is confident there is enough talent in the squad to secure a place in the end-of-season play-offs. Baldwin was outstanding in Posh’s 1-1 draw at Blackpool yesterday (February 18), but a third successive draw - the home team’s equaliser was extremely controversial - has left his side five points and three places outside the play-off zone. They could drop to 11th tomorrow (February 20) if Portsmouth gain a point from their trip to managerless Fleetwood and Gillingham win at table-toppers Shrewsbury. Steven Taylor missed a League One match for Posh for the first time at Blackpool. 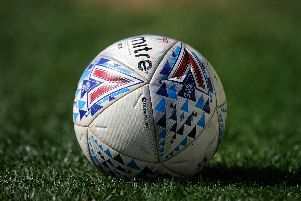 But Posh are targetting two home games against AFC Wimbledon (February 24) and Walsall (February 27) to kick-start their own surge to sixth place. “We’re still confident,” Baldwin said. “Time is running out, but the talent and ability is there. We just have to get back to where we were at the start of the season when the work ethic was strong and we were winning games by a few goals. “It’s been well documented this season how we keep letting leads slip so it was disappointing to do it again at Blackpool. It was more disappointing to hear their striker admit he handled the ball into the net. “But we can’t blame the referee as we had enough chances to put the game to bed. The timing of their goal so close to half-time was bad from our point of view. We should have seen the game through to half-time and then kicked on again in the second-half, but instead the goal livened them up a bit. Baldwin was preferred in yesterday’s starting line-up to Steven Taylor. Taylor had previously played every minute of every League One match for Posh this season.